He remembers it this way. Outside San Salvador, 30 or 40 miles up in the hills, mortars began to hit the village, and bombs cratered the hillside. Run. That was his first thought. And this was the second: Where? It was open all around. The ground shook. The farmers looked at the traveler from Ireland and smiled and pointed. They tried to be reassuring. "That is over there," they said. "We are over here." "I felt," says the traveler, thinking back in a safer place, "such a fool in the face of it. Those guys lived with it all their lives, and it meant nothing to them. But the fear I felt that day . . ." Just talking couldn't say it all. It would take a song. When Bono tears loose on U2's Bullet the Blue Sky, you can still hear the ache of fear in his voice, the closeness of the memory. The song is immediate and passionate, a cry of conscience on an album full of oblique social speculation and spiritual voyaging. The Joshua Tree is not, it would seem at first, a record for these times. Bono and the rest of the Irish band called U2 seem to be citizens of some alternative time frame spliced from the idealism of the '60s and the musical free-for-all of the late '70s. Their songs have the phantom soul of the Band, the Celtic wonderment of their compatriot Van Morrison and some of the assertiveness of punk, refined into lyrical morality plays. Their concerts are as revivifying as anything in rock, with a strong undertow of something not often found this side of Bruce Springsteen: moral passion. U2's songs speak equally to the Selma of two decades ago and the Nicaragua of tomorrow. They are about spiritual search, and conscience and commitment, and it follows that some of the band's most memorable performances -- and, not incidentally, the ones that have helped U2 break through to an even wider audience -- have been in the service of a good cause, at Live Aid or during last summer's tour for Amnesty International. This is not, then, just a band for partying down. "Partying is a disguise, isn't it?" Bono asks, and does not wait for an answer. This is a band that believes rock music has moral imperatives and social responsibilities. There is no one better than U2 at bringing "over there" back "over here," and setting it down right by the front door, where no one can miss it. U2's sixth and best album, The Joshua Tree, in stores for little more than a month, hit No. 1 on Billboard's chart this week. The album's first single, With or Without You, has made the band's heaviest mark on Top 40 radio and is already in the Top Ten. Other tunes on The Joshua Tree (the title was inspired by a California desert town where '70s Rocker Gram Parsons died) are likely to keep it company. 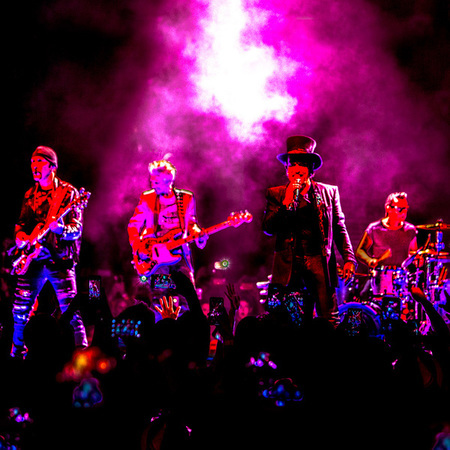 U2 launched a scheduled 18-month world tour in Arizona just three weeks ago, will play the U.S. through mid-May, perform in Europe most of the summer, then return to the States in September. "I guarantee you that | when U2 comes back this record will be bigger than ever," says Andy Denemark, a director of programming at NBC Radio. "There's a lot of depth to this album." He means depth of the commercial, not thematic variety, but he is right in either case. "People are always saying U2 is the largest underground act in the world," says their manager, Paul McGuinness. "I suppose that's true, but it is starting to change." And in a hurry, at that. Ask Thom House, who sold U2 concert tickets for local gigs via computer at his two video stores in New York and New Jersey. Crowds started lining up at his Manhattan store Thursday night, and at first, he says,"I had no idea why they were there. I chased them away, saying we were not selling tickets until Saturday. They kept coming back. We bought movie tickets and passed them out, so they could leave and come back. They stayed. It started raining. They stayed, hundreds of them. This group must rank close to the Beatles." Just a second. The sound you hear is brakes being put on, and it is the band that has the heaviest foot on the pedal. "We don't think we're that good, really," says Bono, 26, who writes the lyrics and fronts the band both as lead singer and resident shaman. "We think we are overrated, and though we're concerned about living up to people's expectations, it scares us even to live up to our own expectations." "The band is at a frontier," says Bass Guitarist Adam Clayton, 27. "You don't get something for nothing. This tour is definitely frightening." It is also taking on distinct phenomenological proportions. Even in Arizona, in the earliest stages, with Bono's voice raggedy from overrehearsing and with the band searching for a solid connection with both the audience and one another, there was a final fusion of performer and spectator that is one mark of great rock 'n' roll. Some of the songs, especially earlier efforts, can get tongue-tied by the unwieldy ambition of their lyrics and the discursiveness of the melody line. The audience shares a devotional intensity, however, that anchors the concert as a whole experience even when the tunes range free. Bono stalks a song as much as sings it, and the moment he takes the stage there is no doubt what his terms are: unconditional surrender. Clayton and Drummer Larry Mullen Jr., 25, have found some solid musical grounding, and the lead guitarist, the Edge, 25, can work a riff around to an epiphany. It is on Bono, however, that all eyes stay fixed. U2 carries the day, but he carries the show. That has always been the way, ever since the band's first scuffling days in Dublin during the punk whirligig. "They were very bad," admits Manager McGuinness. "But it wasn't the songs that were the attraction. It was the energy and commitment to performance that were fantastic even then. Bono would run around looking for people to meet his eyes." Once met, those eyes are well remembered. They lock in for good as he travels the stage in a perpetual panther prowl. His presence is not specifically sexual, but it is intensely sensual and lends heft to his lyrical excursions. It also gives the spirituality and frequent Christian symbolism of the songs ("See the thorn twist in your side"; "I stand with the sons of Cain") a welcome grounding in earthly delights. "Their show is the best around," remarks an appreciative T Bone Burnett, a guitar player and record producer (Elvis Costello, the BoDeans) of no mean skill. "U2 is what church should be." Lest such praise become a little burdensome, Larry Mullen keeps this reflection handy: "At the end of the day, it's just rock 'n' roll." For audiences, though, that music can be a lifeline. A Springsteen song can tap right into your daily existence. A U2 tune like Running to Stand Still, with a trancelike melody that slips over the transom of consciousness, insinuates itself into your dreams. Patty Klipper, from Parsippany, N.J., says, "First they opened my mind to their music. Then their music opened my mind to the world." The band's official fan magazine, called Propaganda and edited by their tour lighting director, is a neatly turned out publication that features the usual inside-band stuff as well as some unexpected calls to political action. Fan publications usually urge readers to stay in touch with the musicians. Propaganda urges them to write letters on behalf of Amnesty International: "Please write to the federal authorities in Yugoslavia, asking for the immediate and release of Dr. Nikola Novakovic and all other Prisoners of Conscience. Write to: President of the Presidency of Bosnia-Hercegovina . . . Begin your letter 'Your Excellency . . .' "
His Excellency is not likely to invite the band to fall by for plum brandy and cabbage rolls, and U2 is probably not at the top of the White House invitation list, either. They are dead serious about their liberal activist politics although careful not to be sanctimonious. Clayton talks worriedly about some fans turning to the band "needing to be healed," and Bono says," I would hate to think everybody was into U2 for 'deep' and 'meaningful' reasons. We're a noisy rock-'n'-roll band. If we all got onstage, and instead of going 'Yeow!' the audience all went 'Ummmm' or started saying the rosary, it would be awful." The band shares a kind of ecumenical, nonspecific spirituality. Bono, the Edge and Mullen are Christians, although of a particularly loose-limbed variety. The Edge: "I suppose I am a Christian, but I am not a religious person." Bono: "I feel unworthy of the name. It is a pretty high compliment. But I feel at home in the back of a Catholic cathedral, in a revival hall or walking down a mountainside." Mullen: "I am a Christian and not ashamed of that. But trying to explain my beliefs, our beliefs, takes away from it. I have more in common with somebody who doesn't believe at all than I do with most Christians. I don't mind saying that." Clayton, who alone has not announced formally for Christianity, says simply that for journalists "religion was an easy angle, a hook to hang a story on. We all believe in much the same things but don't express ourselves in the same way." This, along with Clayton's inborn rebellious instincts and up-tempo temperament, caused some intramural tension that has only lately been resolved. "I was in the wilderness for a few years, so there was a natural antagonism within the band that people picked up on. Now the spirituality contained within the band is equal to all the members." Clayton, tan and muscular, with an army recruit's haircut and a pair of steel-rimmed spectacles that makes him look like an insurrectionist with a bass instead of a bomb, remains U2's most sulfurous presence, lending a slight but leveling tension to the stage show. Still, the band's fervor comes from deep springs, not simply from sheer showmanship. "Great songs and all that great heart," says Lou Reed, a formidable musician whose influence can be heard on Running to Stand Still. "U2's not a pop group. They are in this for real." For high stakes too. The band's commitment, to its audience and its music, sanctions and encourages the kind of social concern that in the Reagan '80s became unfashionable, even antique. The album that The Joshua Tree displaced from the top of the chart is a revisionist rap record by the Beastie Boys, three well-born white teens copping street attitude but assuming social postures that teeter between preening smugness and snide irresponsibility. After arriving in Arizona, U2 discovered that Governor Evan Mecham had canceled the state's observance of Martin Luther King Jr.'s birthday. U2 considered canceling the concerts but did something better: made a contribution to the Mecham Watchdog Committee and played Pride (In the Name of Love) -- a tribute to King -- with a joyful vengeance. But it is not just that U2 is on the side of the angels. It has given a new charter and a fresh voice to conscience. "A sense of humor is something I value," Bono says, "but we don't play rock 'n' roll with a wink." Without sermonizing, they have become a rallying point for a new and youthful idealism. After Live Aid and Farm Aid and after the Amnesty tour, after heated and heartfelt music from Jackson Browne and Little Steven, it is no longer corny or uncool to be concerned, to get involved. And especially after the breakaway success of U2, it seems that audiences are ready to take heart and to reach out. There are, as Bono sings in the opening of In God's Country, "new dreams tonight." "Nobody knows how it works," Adam Clayton says. "You turn the music up as loud as you can and hope people like it." Mullen admits, "I do believe our music is special. But you have to separate the music from the people. The music is special, but I don't think we are. We are ordinary people." They are earnestly going about trying to "demythologize" themselves, as T Bone Burnett puts it, cutting themselves down to manageable size, the better to handle their superstar stature. It is a posture that is both defensive and pragmatic, disarming and perhaps just a shade desperate. "People respond to our naivete," Clayton insists. "I think they see four guys from Ireland who don't want to let go of their dreams." It was Larry Mullen who set the dream in motion. He posted a note on the bulletin board of Mount Temple, a public high school in Dublin, asking if there was anyone interested in forming a rock band. That was in 1976, and he was 14. "Stories simplify how big a step that was at the time," says Clayton. "That one action of Larry's has affected the rest of his life and, indeed, everyone's." David Evans (yet to be called the Edge) was a top student in his Mount Temple class, but he had been spending spare time "strumming away" on acoustic and electric guitar. When he saw that notice, he felt a decidedly nonacademic stirring in his soul. "Ah," he thought, "this could be it." Mullen had been playing drums since the age of nine, charging money for household chores ("I should have done them anyway, I know") in hopes of getting his own kit. His parents finally gave him part of a set -- made by a toy manufacturer and retailing for $15 -- at which young Larry happily flailed away until his father, an environmental-health inspector and part-time optician, suggested he try to get a group together. "You are not going to get anywhere," the senior Mullen pointed out, "if you continue playing on your own." The Saturday after the school notice went up, six or seven Mount Temple students appeared in the Mullen kitchen and started playing Rolling Stones tunes. "During the course of the afternoon," Mullen remembers, "I saw that some people could play. The Edge could play. Adam just looked great. Big bushy hair, long caftan coat, bass guitar and amp. He talked like he could play, used all the right words, like gig. I thought, this guy must know how to play. Then Bono arrived, and he meant to play the guitar, but he couldn't play very well, so he started to sing. He couldn't do that either. But he was such a charismatic character that he was in the band anyway, as soon as he arrived. 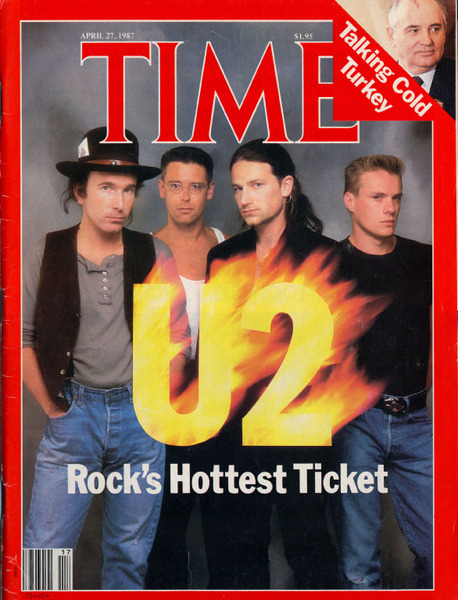 I was in charge for the first five minutes, but as soon as Bono got there, I was out of a job." The boys who became U2 -- the name, suggested by a local musician pal, refers ironically to the high-altitude spy plane -- all knew of one another, vaguely, from school. The Clayton and Evans families were friendly. The Edge, whose family is Welsh, and Bono (still generally called Paul Hewson back then) had briefly gone to the same guitar teacher. For his part, Bono had a distant but still vivid impression of Clayton, who was raised outside London and in Kenya, and had moved to Dublin with his mother and airline-pilot father at the ( age of eight. He had come to Mount Temple from boarding school "pretty freaked, terrified I was going to get beat up. I thought the quieter you kept, the more wary people would be. Intimidate them and not give anything away." It worked. "Clayton was an incredible rebel, in the true sense of the word," Bono recalls fondly. "He would come into class with a flask of coffee and put it up on his desk and start to drink. The people would blow their heads. Clayton's other prop was his bass, a gift from his parents ("I'll play till I'm bigger than the Beatles!" he promised them), which he handled with similar elan. It became clear after a little time, however, that there were certain limitations to style. The Claytons were dubious when the band started to talk about turning pro. "Quite sensibly," the Edge remembers, "they realized this business is very hard and that Adam is not the world's most gifted musician and what possible chance has he got of making it. My folks probably made the same calculation." "Adam's amazing," says Bono flatly. "He just pretended he could play the bass, when in fact he couldn't. And at the age of 16, he pretended he knew the music business inside and out." He, of all the four, saw the band as his future. He had to. Bono was dubious at first about joining up ("I thought rock was ugly"), and the Edge at these early stages "didn't ever consider the band as anything other than a worthwhile thing to do on Wednesday afternoons." 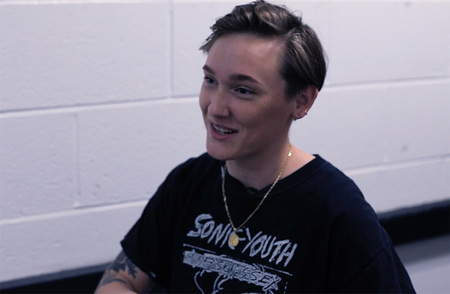 Mullen, the youngest of the group, could only dream of a career, while Bono and the Edge were getting on with their education and taking their final exams. Clayton, however, had been booted out of Mount Temple, and worried about "commitment" from the others. He hustled hard, trying to force their hand, and made contact with McGuinness. The band, which had gone through a variety of names, including the Hype, was better with chutzpah than with chords. "You see," says Mullen, "we couldn't play. We were very, very, very bad." In the first hot flush of punk, this did not greatly matter, and after seeing them in 1978, McGuinness, who had done mostly film-production work up until that moment, agreed to become their manager. "It looked to me like they would be a great rock band," he says now, adding, "I've only had to be right once." McGuinness farmed himself out for the occasional production job and began to "live off my wife." The boys, still living at home, would occasionally be ! driven to dates by a stray mom or dad. This sort of early scuffling can break a band or bond it, and with U2 it seems to have brought the group closer. After a bit. "The first couple of years," says Clayton, "we kind of hated each other. It was very competitive, and everyone was trying to come out on top." As the band gigged around, scrambling to get heard by record companies and earn a little living money, there were third-party suggestions that one member or another be dropped in the interest of strengthening the band's musicianship. All such notions were rejected out of hand. "We never, ever felt that being a great musician was a necessary qualification for being in U2," says McGuinness. "The individuals were much more important than whether you could play." There were other ties, ones that stayed strong beneath the surface tension. Grief could be shared, understood. When he was 15, Bono's mother died from the effects of a stroke she suffered at his grandfather's funeral. Mullen lost his mother in a traffic accident in 1978. "The thing that has kept us going," he says now, "is the fact that we are friends. This whole band is based on our friendship. If it had originally been based on our music, we would have failed." After some patchy times and a couple near misses with record companies, McGuinness struck a deal with Island in 1980 that allowed an unusual amount of creative independence ("They had to accept the record without any question"), and the band released its first album, Boy. That same year, it paid its first visit to America, opening in Boston for a band of what Bono calls "some local renown. We started to play, and all the people started standing up, turning over the tables. The place was packed. Steam was dripping off the ceilings, and they wouldn't let us leave the stage. We had one, two, three encores. I just looked at Edge and said, 'Hey, wow, if this is America, I want some more! This is it!' " When the star attractions finally made it to the stage, the club was empty. It would take U2 a couple more years and two more albums before it could compound that Boston frenzy worldwide and come up with the first song that could stand as its anthem. That was Sunday Bloody Sunday from 1983's War, a tune about the divisive heat and blind violence of modern Ireland that curried no favor on either side. War was U2's best work until The Joshua Tree; the year after its release, Island, detecting seismic vibrations, renegotiated the band's contract with McGuinness. "Now U2's in an absolutely unique position," he reports. "They own outright every song they ever wrote, and they always will." The contract also made them flush, and that of course has further quickened the collective conscience. Bono has been flabbergasted to read that he and his wife Alison, another Mount Temple grad, live in a seaside castle near Dublin. "It's a little round tower," he laughs. "Three levels, three rooms." Domesticity presents its own problems. Although he, like the rest of the band, cherishes a bit of personal distance and privacy, Bono acknowledges, "My life is just a mess. When I am away, I'm not at home. When I'm home, I'm not at home. I come in when she is going out." Ali, who is studying politics at Dublin's University College, "is the dark eye," in the words of her admiring husband. "She will not be worn like a brooch. We have a stormy relationship because she is her own woman." While in Arizona, worried that she sounded a little depressed on the transatlantic phone, Bono asked his in- laws to "keep an eye on her. They must have rung her right away, because I got this phone call saying, 'I don't need a baby-sitter!' and she slammed down the phone." Ali made an unscheduled appearance in Arizona 48 hours later and stayed five days. Mullen, who added Junior to his surname after his father began to receive large tax bills meant for his prosperous son, lives on a beach near Dublin. His girlfriend does office-temp work, so she is free to join the tour at frequent intervals. "I live in a nice house and don't feel bad about it," he says. "But I don't drive a flashy car, first of all because I don't want to, and second of all because I think that would be rude in a country like Ireland, where there is high unemployment." Clayton lives in Dublin ("an incestuous place"), though his dreams of taking off for "another climate, a beach somewhere" are tempered by the sure knowledge that "I'd always return." With his wife Aislinn, who works for a boutique, and their daughters, the Edge also lives in Dublin, although he frets, "My life revolves around the music, the keyboard. My family should make a difference, but I am not able to spend enough time with them." Politics and the past make perpetual demands, of course. The band underwrites Mother Records, an outfit that gives young bands their first shot. "We're trying to provide an opportunity for Irish groups," McGuinness says. "You don't have to be Irish, but it helps. We do have one Scottish group." Besides the trip to El Salvador last year, Bono and Ali found time for seven weeks of relief work in Ethiopia, and Mullen tries to stay tapped in to the roots: "All the neighbors knew my mother, and I try to drop in on them occasionally, just to keep my foot in." Celebrity, however, does have its inconveniences. "When you go into a shop, and you're in the only successful band to have come out of Ireland since whenever, every father and uncle and grandmother knows who you are. It is embarrassing when you want to go buy some socks." There are further signs of changes and counterbalances as well. 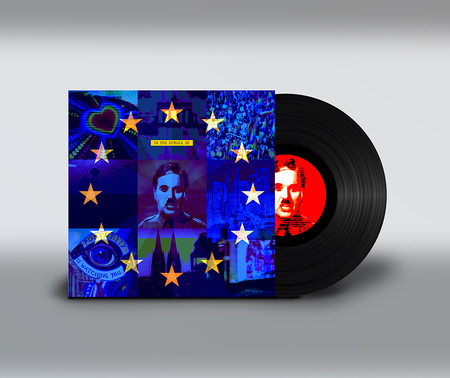 Although Bono has received lyric credit on the last two albums, the songwriting has traditionally involved the whole band, "chipping away," as Mullen puts it, "chipping away and doing it until it feels right. It takes an awful long time and is incredibly frustrating." Sometimes the system works well -- Pride (In the Name of Love) was written at a sound check in a total of seven minutes -- but the Edge is mulling over further streamlining. "I think in the future Bono and I will work together more closely," he says. "It seems to be a quicker way. When you've got everybody there, it can be very fun, but slow." However this may affect the rest of the band, they are all agreed on one point. 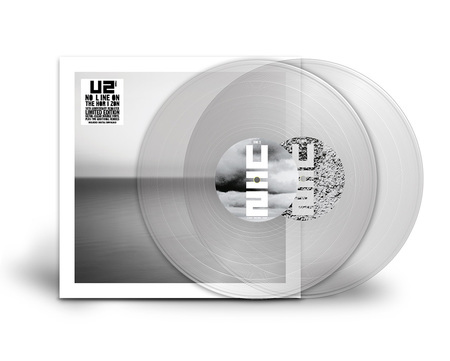 "The Joshua Tree is the best record we've made to date," Bono declares, "but it will not be our best record by a long shot." Bono has been reading Walker Percy, Flannery O'Connor and Raymond Carver and has promised to write new songs during this tour. He has already begun one, based on a recent video shoot at a grungy Los Angeles location and a chance encounter with a gay Viet Nam vet. "I spotted empty bottles all over the roof with the label Wild Irish Rose wine," he says. "So I started this song. It is about suicide. The opening line is 'This city of angels has brought a devil out in me.' " (Well, the band has been listening to a good deal of country music.) He yearns to write a song that, as Manager McGuinness puts it, "could go into the language." And my shame . . .
Let them run on, then. They are not likely to get caught. And they already know the way home.